While on our trip Avery got to pick out a new cover for her iPod touch. We had it mailed home since we weren’t sure it would get it Boise in time before we left. Avery was disappointed when it wasn’t waiting for her when we got home. It was with our stopped mail, so I was able to pick it up on Monday. Question is, where is Avery’s iPod touch? We’ve contacted the airline and put in a claim. We’ll see what happens. 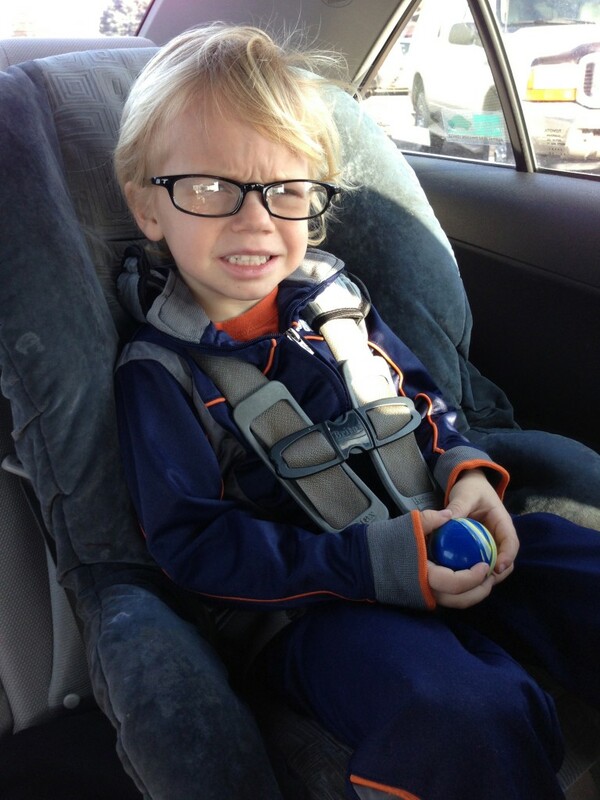 Sawyer has always liked Avery’s fashion glasses and has asked a few times for his own pair. Avery’s glasses have all been purple, pink and blue. Way too girly for my boy. My sister searched and found a small pair of plain black glasses for him. He was really excited when he pulled them out of his stocking. 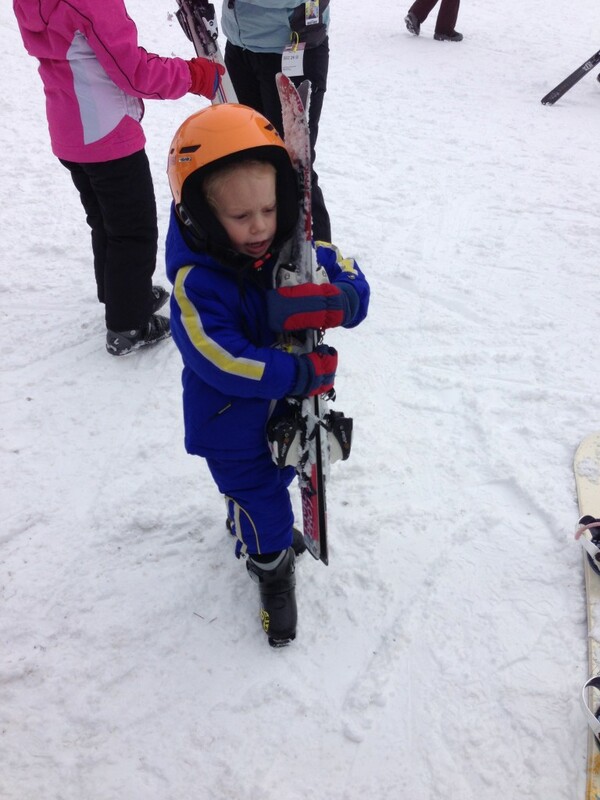 Thanks Auntie M.
We took off one afternoon to take the kids skiing. 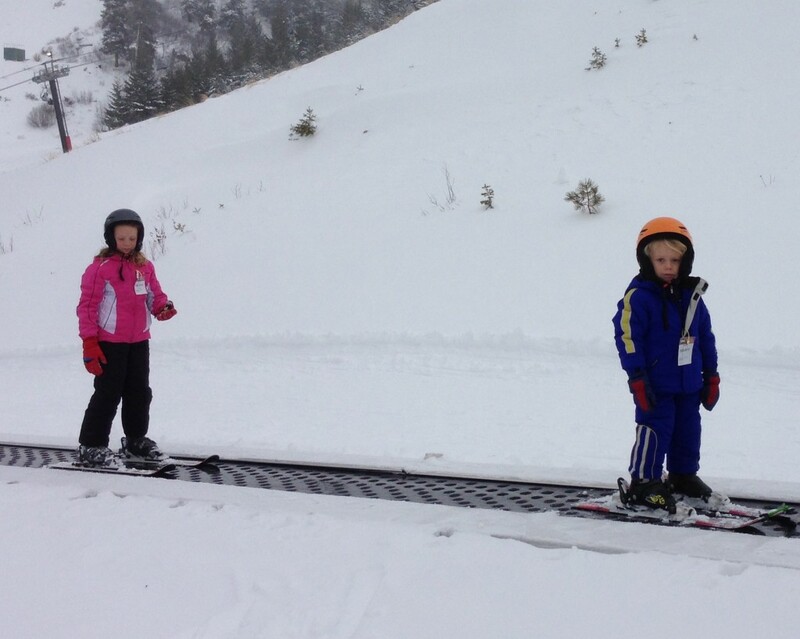 Avery took a lesson two years ago and Sawyer had never been on skis. We thought he’d be pretty good at it since he can ice skate & roller skate. We were right. They both did awesome! We decided to put them both in a two hour private lesson. Sawyer was born ready. I showed him a youtube video of some little boys skiing that morning. He wasn’t hesitant at all. Going up the “magic carpet.” It was conveyer belt type thing that kept on moving as the kids side stepped on and off. By the end of the lesson they were going up the chair lift. 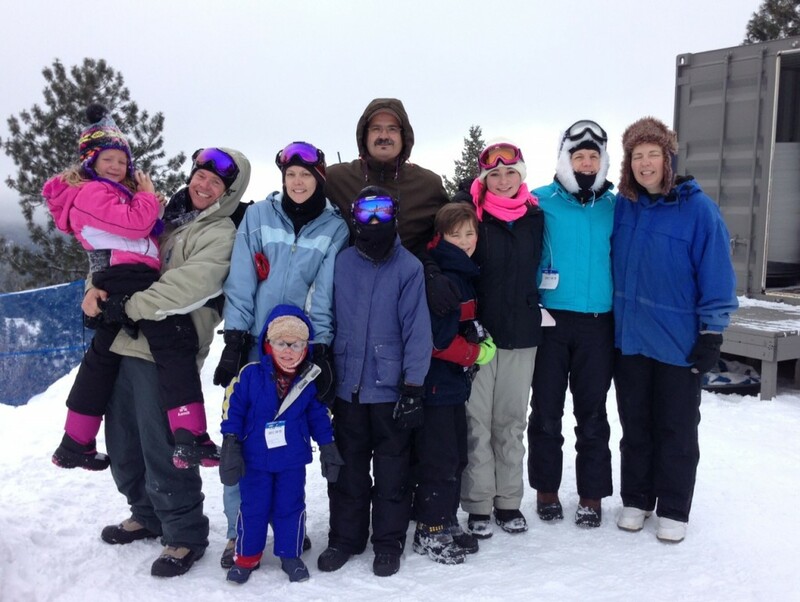 They rocked the slopes. 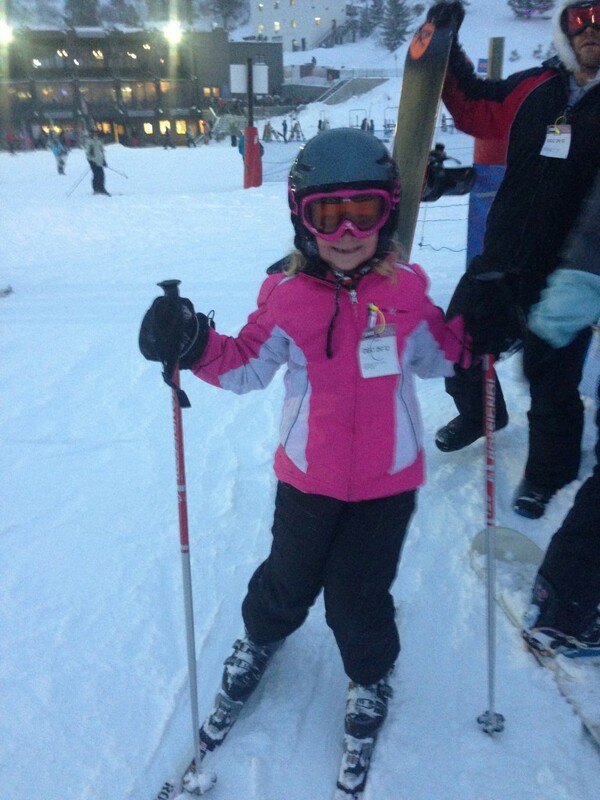 Avery really enjoyed her time on the slopes. She was a little disappointed that she didn’t ski with poles, so she’s using mine here. She took my poles up the chairlift, and somehow left one of the poles on the chairlift. It was waiting for me when I got back to the bottom. She didn’t complain at all- very unusual. While the kids were in their skischule Dan snowboarded and I skied. I haven’t put on skis in 9 years. I still got it. I was shushing down the slopes and didn’t fall once- thats because I’m too cautious. After the 2 hour lesson we kept going, that proves just how much fun the kids were having. I’m really glad we all got to ski. Sawyer is old enough now to join us in more and more activities. What’s next? 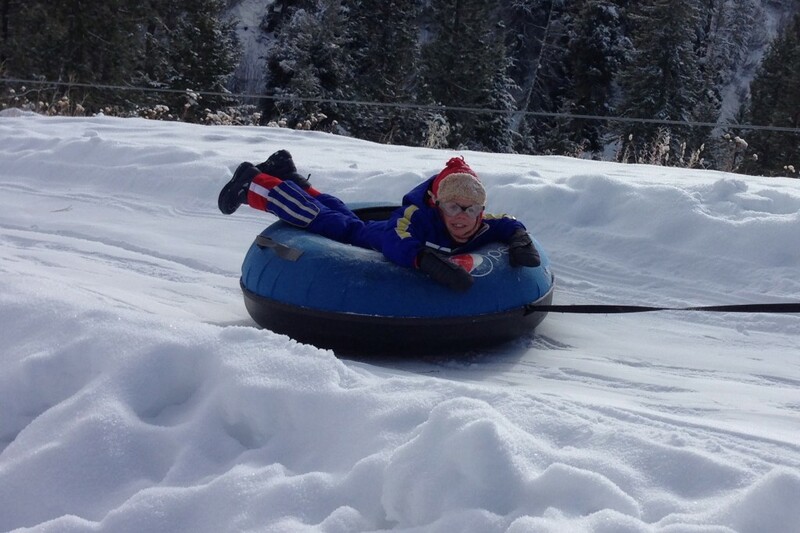 Tubbing- pronounced “toob-ing” although in English it should be pronounced “tuh-bing.” The english language!! It was a beautiful day- sunny with no wind. We were excited to get there and speed down the hill. 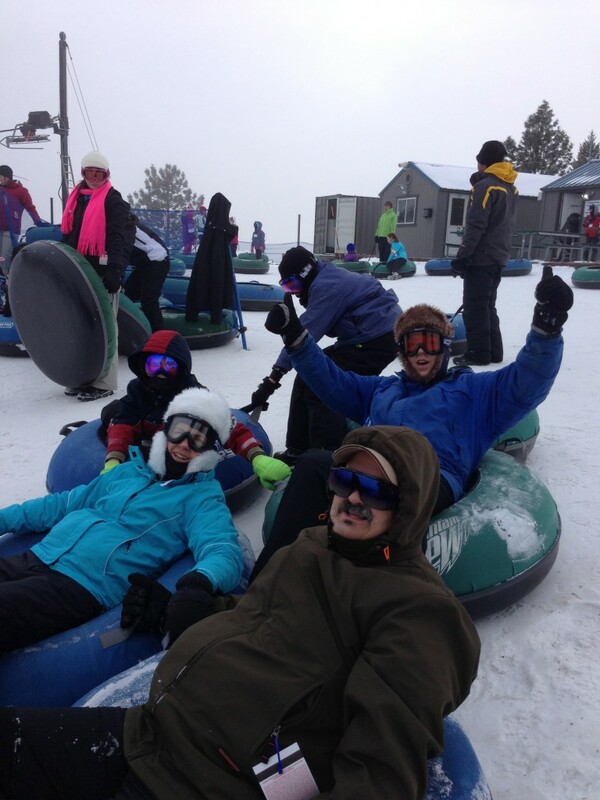 Last year we weren’t able to go tubbing since there was no snow. We were all set at the top of the hill… ready, set go… and we barely made it half way down the mountain. The guys working there said it was because there was a lot of new snow and it wasn’t packed down enough yet. 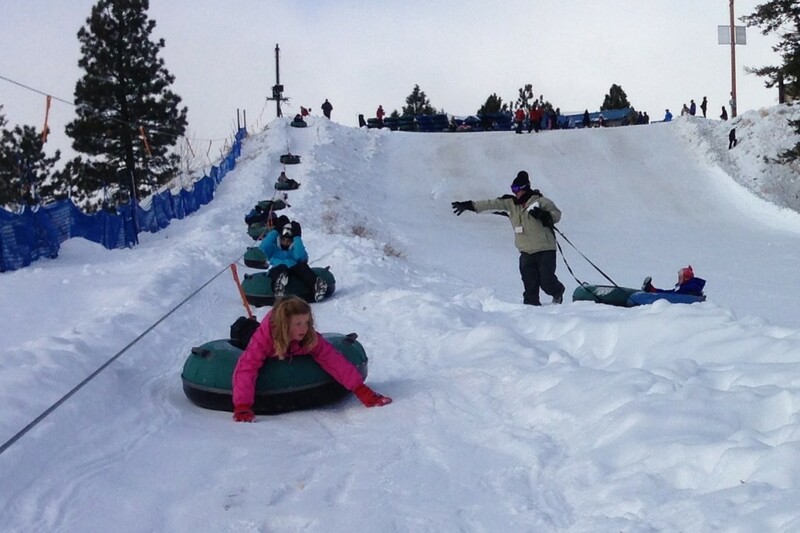 Whatever the reason I think I walked down the hill more that I tubed down it. ready to go down all connected. Could be dangerous… if someone gets in our way. 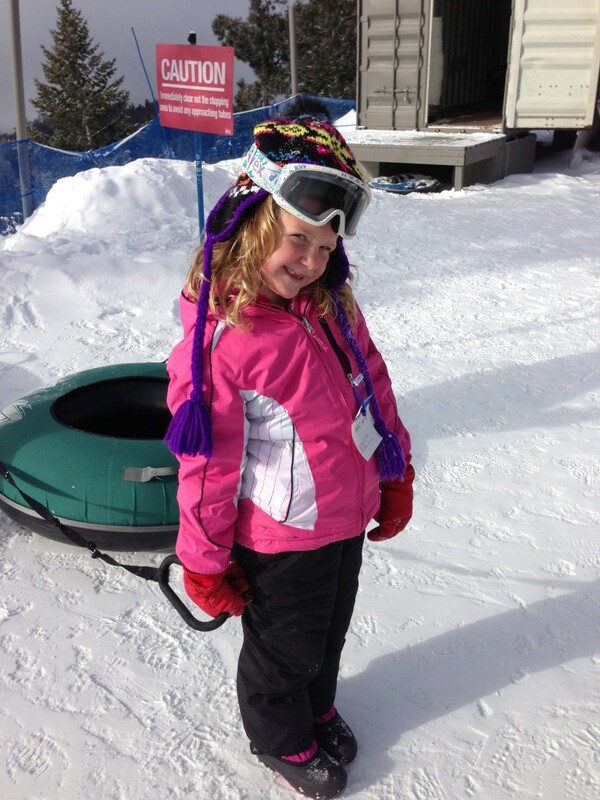 My princess ready is ready to hit the hill. Sawyer going up the rope tow. He had so much fun going up and down the hill. Yes, he is wearing swim goggles. We make due with what we have. Dan and Sawyer decided it would be funny to throw snowballs at us going up the rope tow. Glenda is in the blue jacket and Avery is in the pink. We didn’t find it funny. He totally got me with a big fluffy snowball. Snow got into my glove, on my face and hand that was taking pictures. I couldn’t put my phone away either. I do not like being wet or cold and he knows it. I was not happy, but he thought it was hilarious. A fun winter activity, that’s for sure. Not too many tears during our two hours on the hill. We did have quite a few laughs and cold hands and feet. We celebrated New Years Eve by hanging out. I made peanut butter chocolate chip brownies with chocolate and peanut butter frosting (very rich), Dan helped my dad on his computer. Sawyer went to bed at a decent time. Avery went to bed around 9, but we got her up at 11:30 to ring in the new year. 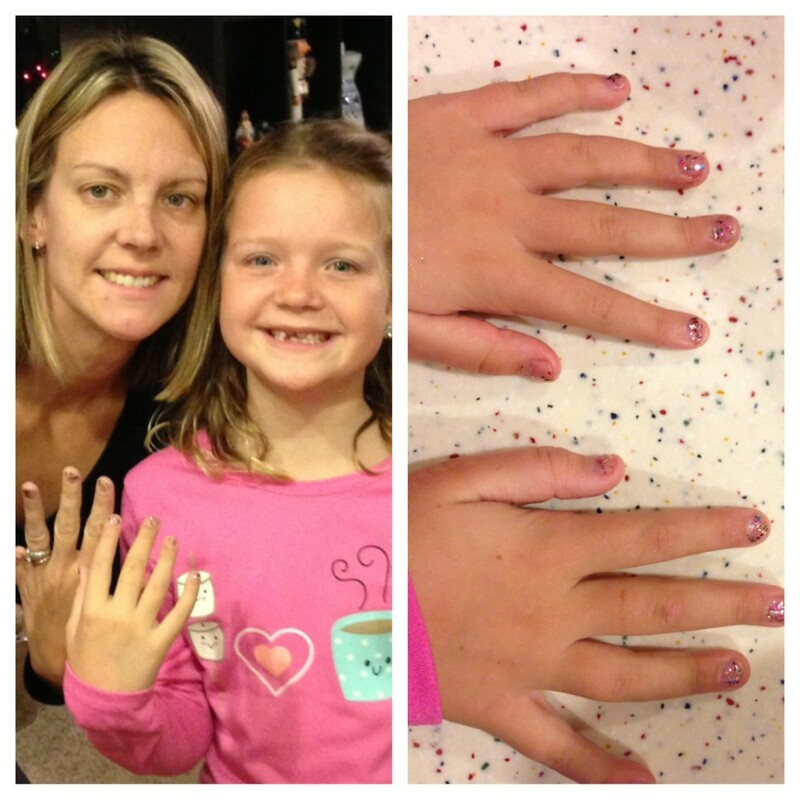 In that 30 minutes she had some ice-cream and we painted our nails. 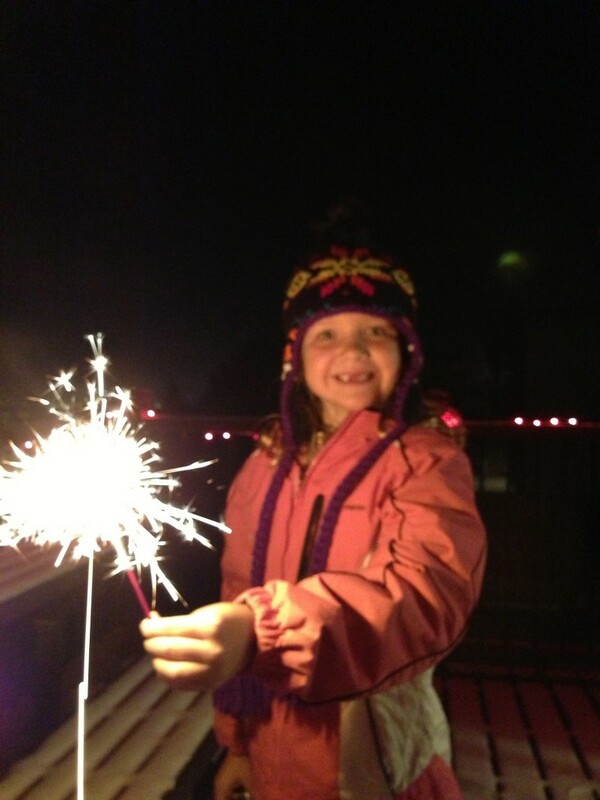 At midnight we went out on the snowy deck to light sparklers. We saw a few fireworks displays (not shows) down below in the city of Boise. 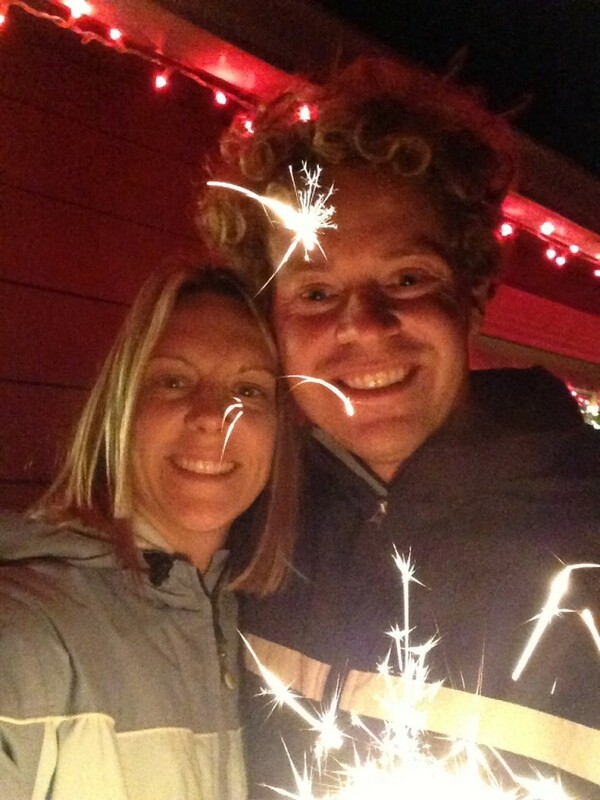 It was bitterly cold so after just a few sparklers we were done. Sawyer slept through it all, and even slept in this morning. THank you, son. 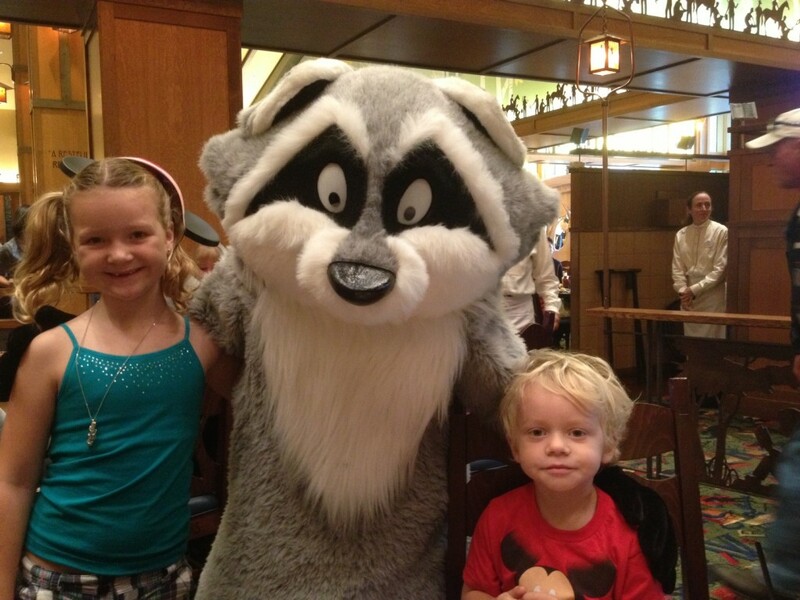 Day 1- We ate breakfast in The Grand Californian Hotel. Big buffet and lots of characters. It was really fun to have the characters visit our table and “talk” to us. Not sure how they decide which characters come out since they seem so random. After breakfast we were all super excited to go to Cars Land in California Adventure. There are 3 rides in Cars Land, some eateries and fun stuff to look at. We didn’t make it on time to get a fast pass- they ran out at 10am! We decided that we would stand in line for the ride… 3 hours! When we went to get into line Sawyer was measured and he was cleared to ride- 40 inches! We were excited for him. Yes! At 40 inches a bunch of rides just opened up for him! When we FINALLY got up to the front a guy from the “pit crew” (cast member) wanted to measure Sawyer again, no problem, he was cleared at the front of the line… not so fast! The pit crew guy said Sawyer was close, but just didn’t make it. Sawyer was crying, Avery was crying, I was close to tears and Dan was pissed! Avery and I went on the ride while Dan and Sawyer dealt with the debacle. We were really irritated about this! Sawyer was wearing Vans at the time- super flat shoes. I had tennis shoes in the hotel room that I knew would definitely put him over the 40 inch mark. 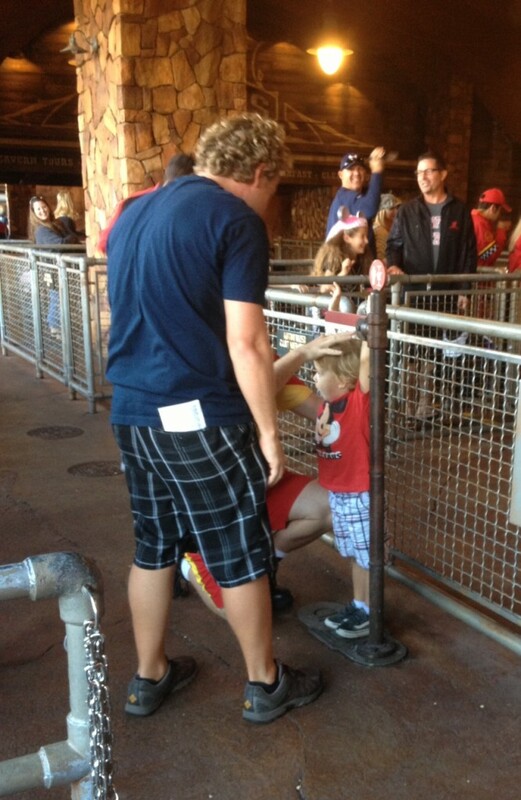 They worked, he got to ride a bunch of new rides in his tennis shoes. 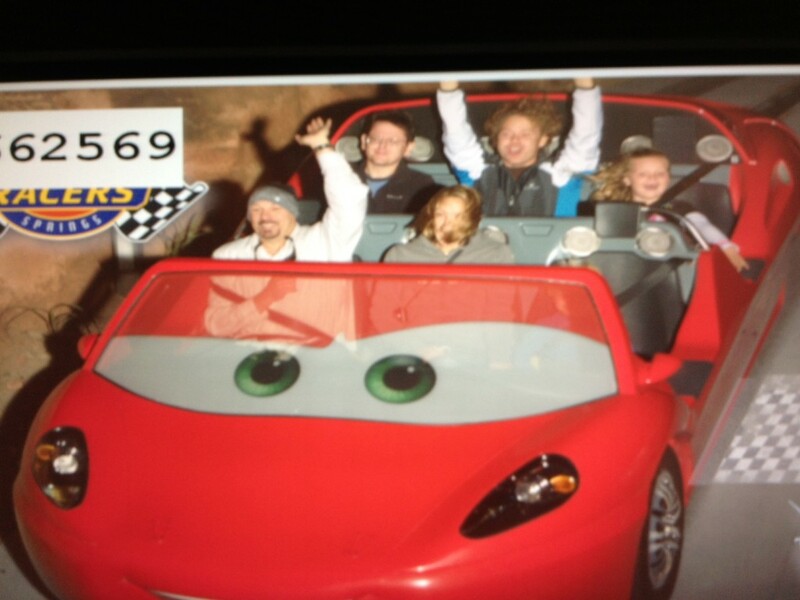 We did get to ride the Cars Ride two more times on our trip. We got to California Adventure early enough to get a fast pass and Dan complained at the Chamber of Commerce and got another one. 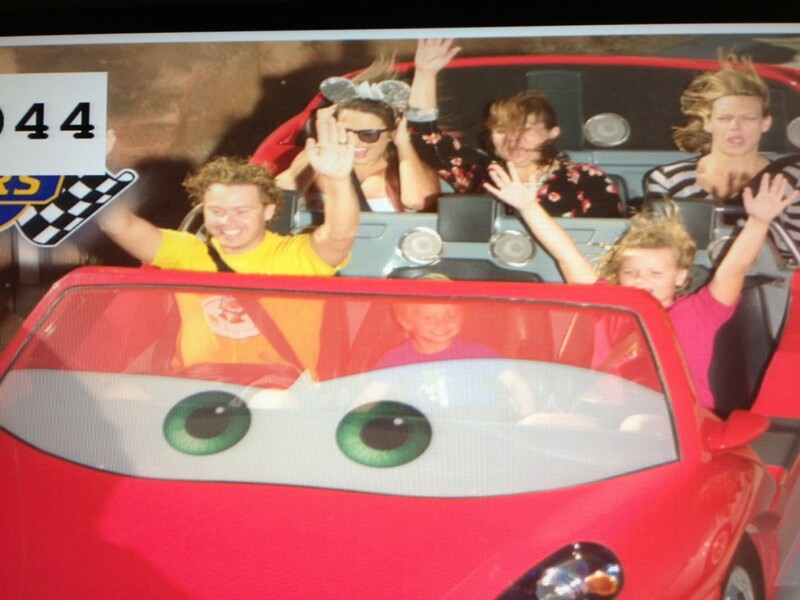 This didn’t make up for our 3 hour wait in line, but Sawyer got to ride so it was worth it. You can’t see Sawyer in either picture, but he was there and he loved it! I don’t want to say we are “anti Thanksgiving” we just don’t “do” the whole turkey dinner thing. We’ve decided to take off during Thanksgiving and get out of town. 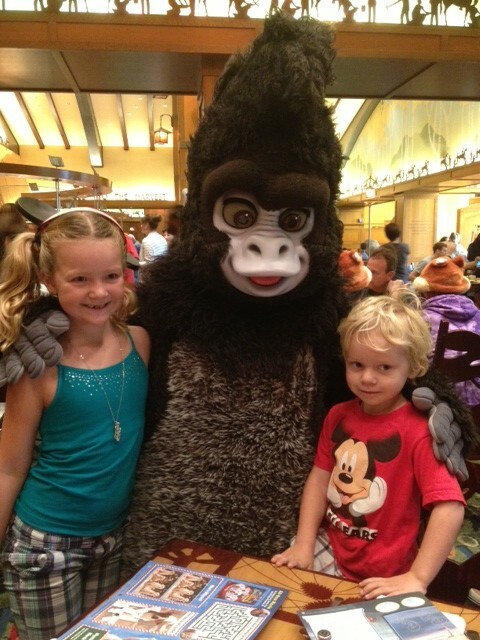 Last year we went to Vegas because my parents and sister were already there. This year we decided on Disneyland & California Adventure for four days. What an experience! We drove to Anaheim on Wednesday, took twice as long as it should have because of all the holiday traffic. We finally got to out hotel and unpackers, then headed to dinner. 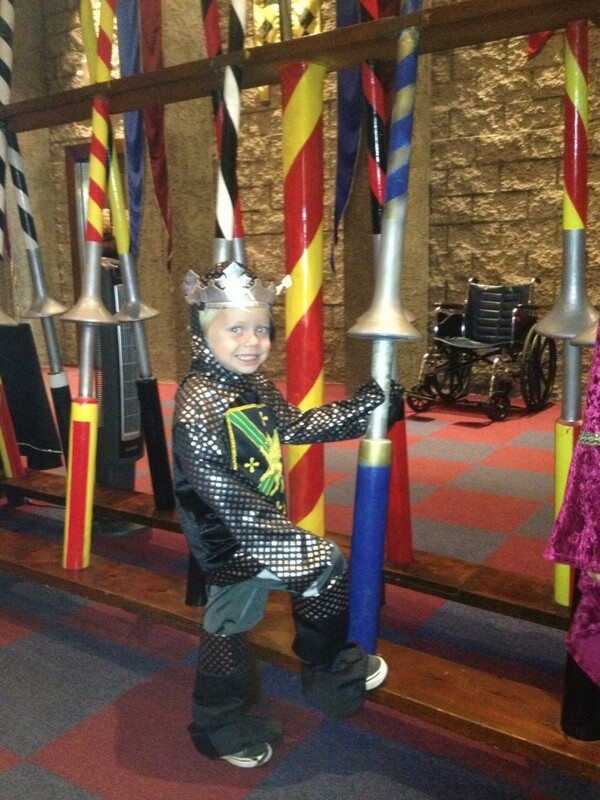 That night we went to Medieval Times- dinner & tourney. I had been a very long time ago, I’m guessing 13 years ago now. Dan and had never been. We all had a great time. Sawyer was a little mad when he realized that he wasn’t going to be actually riding a horse. Dinner was eaten without utensils, messy but fun. The food was good, kids weren’t too excited about it, but they’re picky kids. 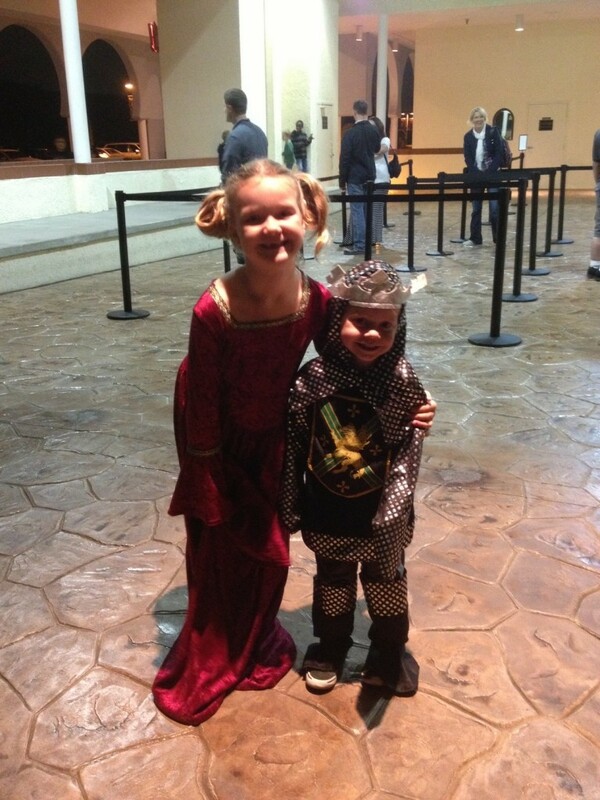 Our knight was the first one out, but the show was a lot of fun to watch. Dan and I make a point to spend one-on-one time with each kid at least once a month. Sawyer’s in school only 3 mornings a week, so we get 2 days while Avery’s in school and 3 short afternoons together till we pick up Avery. Since we get a lot of time together I don’t take time on the weekends to do special stuff with Sawyer. I let Dan take each kid out for a special outing. Today Dan insisted that I take Sawyer while he and Avery did some yard work and so they could both take a nap. I “owed” Sawyer a trip to the mall. A few weeks ago we had to make a quick trip to the mall to pick up a gift card, so we didn’t have time to stop and look into any stores or get a snack. This afternoon Sawyer and I went to the mall. I didn’t realize that “holiday shopping” had begun, the mall was crowded, but not horrible. When we go to the mall we go during the week when it opens and there’s no one there. His choice was to go to “the store with the show” playing- Crazy 8. I had a 25% off coupon so I didn’t mind spending some time in there. Then we took a trip on the mall train. He really loves that train. While on the train we drove by Orange Julius, so we went there after the train trip for a smoothie. Kills me to buy a smoothie ($4.50) when we can make better ones a home for super cheap! The last stop we made was to the Bath & Body Works. Sawyer has been asking for his own hand sanitizer for a few weeks now. Avery has her own that she got from a birthday party. 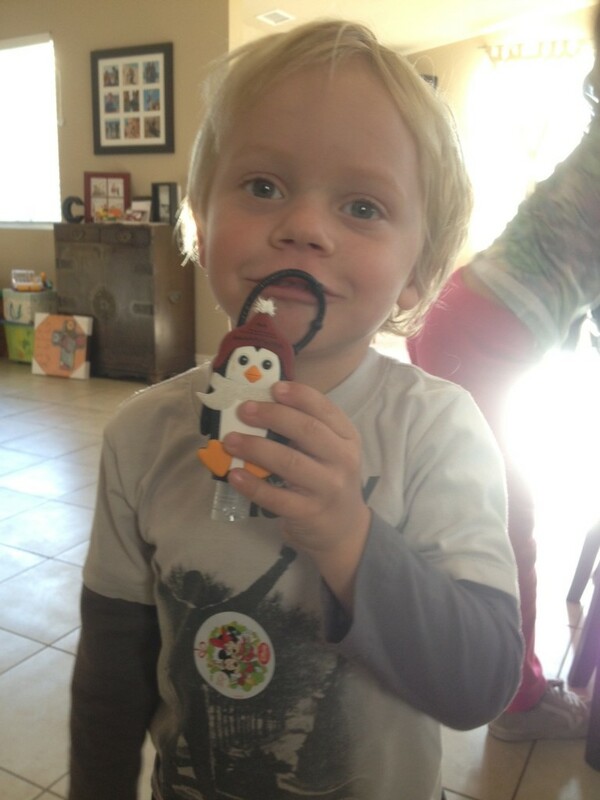 He picked out his own scent (falling snow) and a special penguin holder. He was so happy to use his own hand sanitizer- it’s the little things that make him so happy. I am happy that Dan insisted we leave for a few hours this afternoon. He knows that Sawyer and I both needed to get out together. Took me a while, but I finally made a book for summer 2012. You’ll love Shutterflys award-winning photo books. Try it today. 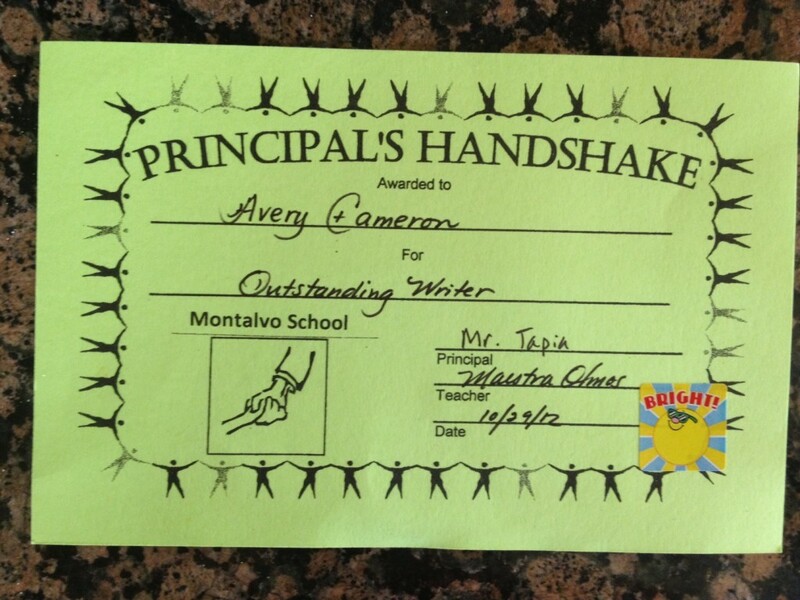 At Avery’s school every month three kids from each class get awarded “The Principal’s Handshake.” By the end of the year every kid will end up receiving this award. I feel that the award isn’t exactly earned, since every kid gets one. Avery was very excited to report that she got “Principal’s Handshake” for the month of October- only the 2nd month these were awarded. All of the 2nd graders had their pictures taken with the principal, a certificate and a prize. She picked out the book The Worst Best Christmas Pageant Ever. A very good choice in my opinion. 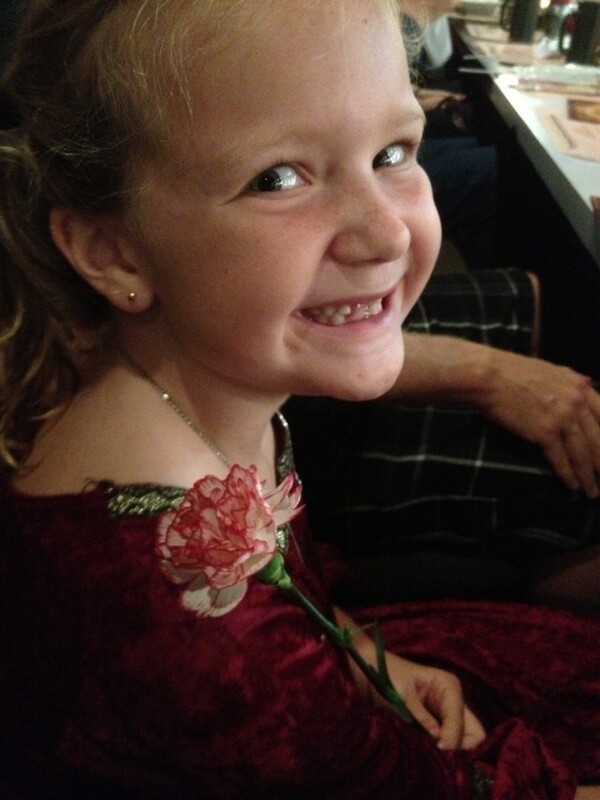 We saw the play last Christmas in Boise. She started reading it the night she got it. Love that she enjoys reading so much.